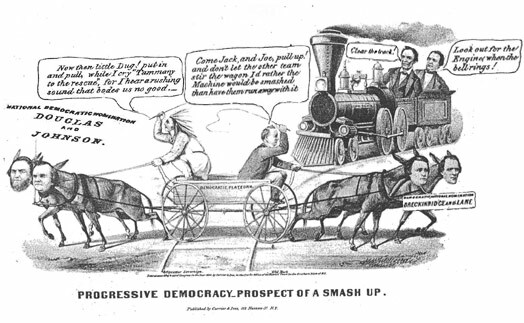 As the 1860 presidential election approached, the Democratic Party was sharply divided. 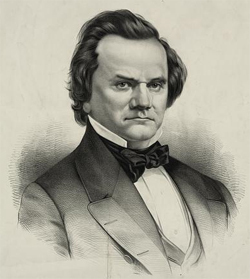 For years, Democrats had endorsed the doctrine of popular sovereignty, which held that whether slavery should be allowed in new territories would be decided by the territory's own residents, advanced by such leaders as Lewis Cass, its nominee in 1848, and Illinois Senator Stephen A. Douglas. Most northern Democrats assumed that decisions by territorial settlers likely would oppose slavery, particularly since the climate and soil conditions of most new territories were not conducive to the growing of cotton. In contrast, the majority of southern Democrats insisted that slaveholders had the same constitutional right as non-slaveholders to bring their property, including slaves, into the territories, thus seeking to establish the principle that slavery had equal standing to free labor. They demanded that popular sovereignty be interpreted to mean that slavery would be allowed from the time a territory was first organized, and that a vote on its continuance be held only at the very end of the territorial stage, after slavery had been established, when a territory sought admission as a state to the Union. When the Democratic National Convention convened in Charleston on April 23, the leading candidates for the nomination were Vice President John C. Breckinridge of Kentucky and Senator Douglas of Illinois. Breckinridge, who would later serve as a Confederate general and Secretary of War in the cabinet of Jefferson Davis and was backed by outgoing President James Buchanan, supported the Southern-dominated platform committee's insistence on a plank promising congressional protection of slave property. During his famous debates with Abraham Lincoln in his successful 1858 re-election campaign for his third Senate term, Douglas had been forced by Lincoln into articulating his so-called "Freeport Doctrine" (named after the site of the second of the seven Lincoln-Douglas debates) in which he took the position that territories and states applying for admittance to the union could either allow or prohibit slavery by popular will and that Congress had no legislative authority to either allow slavery or exclude it. The position, which Douglas also had championed in the Senate in the course of drafting the regional compromises incorporated in the Missouri Compromise of 1820 and the Kansas-Nebraska Act of 1854, helped Douglas win the 1858 Senate election in Illinois, but alienated southern Democrats that he needed to gain the presidential nomination in 1860. The conflict deadlocked the Charleston convention. No faction within the party could gain a majority, and the southern delegates ultimately walked out. When the remaining delegates from the North and West could not agree on Douglas or any other nominee, the convention was adjourned for six weeks. 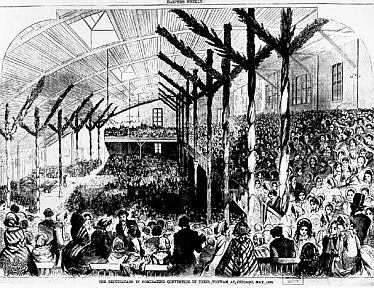 After the Democrats adjourned without nominating their candidates, the Republicans convened in Chicago at the Wigwam auditorium which held 12,000 people. The Republicans opposed the expansion of slavery and called upon Congress to take measures, whenever necessary, to prevent its extension. Most Republicans supported confining slavery within the states and territories where it was presently allowed, but rejected the more radical position of the abolitionists who sought the total elimination of slavery. The early front-runner was New York's U.S. Senator and former governor William Henry Seward. Seward's popularity within the party was undermined, however, by his strong abolitionist stance, along with his past criticism of the anti-immigrant movement. Party leaders believed Seward as the nominee could alienate critical voters from border states and from former members of the nativist American or "Know-Nothing Party," which had received over a fifth of the popular votes in the 1856 presidential election. One thousand Seward men marched behind a smartly uniformed brass band. They wound their way noisily through Chicago’s streets, playing the song ‘O Isn’t He a Darling?’ and finally arrived triumphantly in front of the Wigwam. To their horror, they found that they could not get in; the Lincoln men, admitted with their counterfeit tickets, had taken their seats. Lincoln also had backed tariffs and expanded government funding of roads and other internal improvements, positions that garnered support in manufacturing states like Pennsylvania and New Jersey. While opposed to slavery, Lincoln also had appeared to be somewhat less extreme than Seward, making his potential candidacy attractive to those Republicans seeking a nominee who could win the November election. On the first ballot, Seward led with 173½ votes to 102 for Lincoln, but was well short of the majority of 233 needed for nomination. When Seward was unable to win as expected on the first ballot, he steadily lost support as delegates previously pledged to other candidates swung to Lincoln, who won the nomination on the third ballot with 364 of the 466 votes. Meanwhile, the Democrats reconvened in Baltimore from June 18 to 23, six weeks after their failure to agree on nominees in Charleston. Once more, however, the convention split over the Party's slavery position. Ten delegations left the Party to organize a Constitutional Democratic Convention and nominate Breckinridge, apparently with the tacit approval of President Buchanan. The remaining delegations at the Baltimore convention nominated Douglas, leaving the majority party badly divided going into the fall campaign. The competition for votes was further fragmented by the newly-organized Constitutional Union Party which supported compromise to maintain the Union without advancing a specific agenda. The Party chose former Senator John Bell of Tennessee as their presidential nominee, over Governor Sam Houston of Texas, Senator John Crittenden of Kentucky, and former Representative John Botts of Virginia, all Southern moderates. Edward Everett, former Secretary of State and Massachusetts governor and senator, was named as Bell’s vice-presidential running-mate. Douglas became the first presidential candidate to depart from the historical precedent by which candidates refrained from campaigning personally on their own behalf. Aided by the growing network of railroads, Douglas set a model for future campaigns in launching a direct appeal by the candidate to take northern votes away from Lincoln and persuade southern Democrats to return to the party. The Douglas campaign began with a stump tour of New York and New England, and he later made stops in Pennsylvania, Indiana, Illinois, Iowa, Wisconsin, and Michigan. Surprised by the strength of Lincoln and the Republicans, Douglas also went to southern states seeking to keep Democratic support, moving through Virginia, Tennessee, Georgia and Alabama. In Alabama, he and his wife were injured when the deck of a steamboat gave way, but he hobbled on with the aid of a crutch, arriving in Mobile for his final stop on the day before the election. While the Republican ticket of Lincoln and Hamlin did not follow the Douglas pioneering model of the candidate making personal appearances and speeches, it nonetheless aggressively employed surrogate speakers and used other tools to generate public attention and support. The Republicans also sought to broaden the debate beyond slavery, emphasizing economic issues such as the tariff and internal improvements, like a Pacific railroad, as well as criticizing incidents of corruption in the outgoing Democratic administration of President Buchanan and Vice President Breckinridge. The Lincoln-Hamlin ticket received 39.9% of the popular vote to 29.5% for the Democrats, winning every northern state except New Jersey and also taking California and Oregon. Breckinridge won 18.1% and most of the Southern states, while Bell garnered 12.5% and carried three states—Kentucky, Tennessee, and Virginia. In the Electoral College, Douglas was able to add only Missouri to New Jersey, thus gaining a total of only 12 electoral votes compared to the Republican tally of 180 electoral votes with 150 required for election. Following Lincoln's election, South Carolina quickly moved to follow through on earlier threats to leave the Union; at a special convention authorized by its legislature, delegates voted 160 to 0 for secession on December 20, 1860. In January and February of 1861, Mississippi, Florida, Alabama, Georgia, Louisiana and Texas also approved articles of secession.